What do Daniel Craig, Prince Harry and Prince William have in common? They were all Stormtroopers in Star Wars. Stormtroopers we learn in Star Wars The Force Awakens are just ordinary people in white suits marching around to orders from Kylo Ren. These guys are trained from birth to kill and take over any army. They are excellent marksmen and carry out orders with great passion. In the new movie The Last Jedi we will see more Stormtroopers. In the Force Awakens, we saw some Flametroopers that were equipped with Flamethrowers. I wouldn’t want to be caught in the middle of that fight. 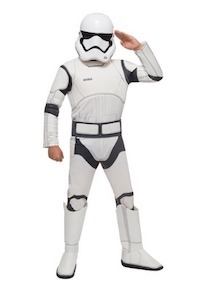 Below are kids stormtroopers, flametroopers and snowtroopers costume ideas so your kid can be whoever they want to for the premier of The Last Jedi, or if there are any Star Wars parties, they can dress up to be whatever and whoever they want. 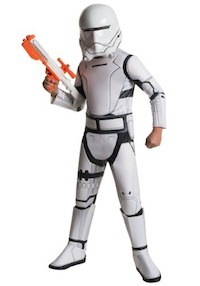 This Child Deluxe Star Wars: The Force Awakens Flametrooper costume comes not with easily misfiring blasters but with a powerful flamethrower! … Of course, it is still the Empire, so the actual weapon isn’t included in the base armor set, but the foam padded jumpsuit, boot tops, and two-piece mask will at least be easy to don and provides actual protection from lasers! 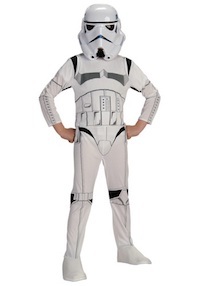 Click here to get the Star Wars kids stormtroopers snowtrooper costume. 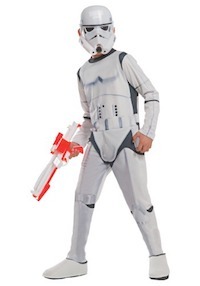 This officially licensed Star Wars costume will have your youngster looking as if he just got transferred from a galaxy far, far away to Earth. Why was he sent to our planet? Well, most likely in order to prepare our planet for an Empire takeover. Everyone will know there is no point in fighting this inevitable outcome. 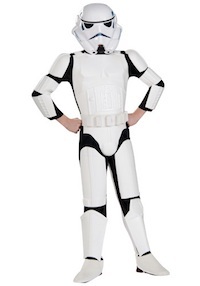 Click here to get the kids Stormtroopers Costume. 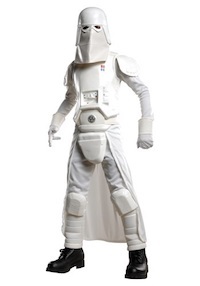 Every Stormtrooper needs the proper gear though, so to make sure you have the correct look be sure to pick up this officially licensed Star Wars Stormtrooper costume. The 100% polyester jumpsuit has white rubber armor pieces attached to the front for a classic look out of the original Star Wars films. The attached boot tops are an easy way to get the full look from head to toe without spending a fortune. A matching white rubber belt is also included. Top it off with the two-piece PVC Stormtrooper helmet and you’ll be ready to fight in no time! The white jumpsuit is printed to look like the classic Stormtrooper armor, and the half-mask looks just like the army’s intimidating helmets head on. 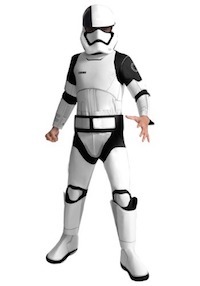 Click here to get the stormtrooper costume for children. The jumpsuit features detailed foam armor plates, and includes a matching molded plastic helmet and foam belt. 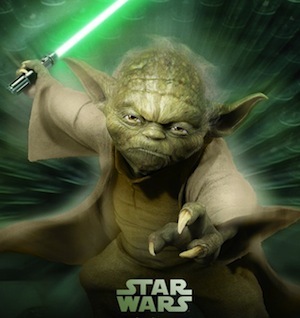 Get them a good toy blaster to complete their fearsome look, which is a great addition to any Star Wars group costume! There are 3 holes along the front of the mouth mesh. 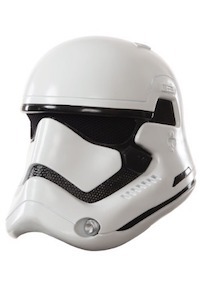 Click here to get the Star Wars Kids Stormtroopers Mask. 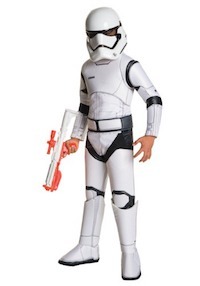 Click here to get the The Force Awakens Finn Stormtrooper costume for kids.